All in compact case qiuck to setup! Raise the production standard of any live event with the amazing built in features of ATEM Production Studio 4K switchers! You get upstream luma, linear, pattern and chroma keying for special effects, as well as downstream keying for logos and lower thirds. You also get 2 built in media players with media storage in the switcher for professional broadcast graphics! The ATEM 1 M/Eand 2 M/E Production Studio 4K models also include a world class DVE for picture in picture effects and exciting stinger transitions. Choose from a wide range of built in transitions! ATEM Production Studio 4K switchers have an amazing choice of transitions including Cut, Mix, Dip and Wipe patterns. The advanced 1 M/E and 2 M/E models also give you key frame based DVE moves, flying graphics and animated stingers! Every transition is instantly available and you get full control of the transition type, pattern, length and more. With so many creative options you can always find the perfect ‘on air’ style, so there’s no limit to the combination of exciting effects you can create! The cut transition is the most simple and widely used of all transitions and you will use it continuously! When you press the cut button, ATEM instantly changes from current program source to the preview source precisely at the moment you hit the button. Cuts can be performed by directly selecting sources on the program bus or more commonly by pressing the cut button to transition to the next source lined up on the preview bus. Cut is easily the most popular transition! One of the most elegant transitions in live production is the dissolve or mix transition. Gradually transitioning from one source to the next by creating a smooth blend between the sources brings out the emotion in your production. You can simply press the auto transition button to automatically trigger a mix between shots at a pre-set transition rate. You can use the t-bar to manually blend the transition for the perfect live mix. Similar to mix transitions, a dip transition is a gradual blend from source to source however, the transition dips to an intermediate third source before completing the transition to the next shot. You can choose to dip to any color, a graphic from the media players or even a live video source. Use black or white for the intermediate source for incredible creativity! For sponsored live productions like sports events, use dip transitions to flash up a sponsor’s logos during the broadcast! ATEM Production switchers have 18 built in wipe patterns, which let you create over 100 different styles of wipe transitions! You can use circles, diamonds, squares and more to transition from one source to the another as you gradually expand the shape to reveal the next source. Patterns can be inverted, softened or have customized colored borders. You can also insert live video into borders creating wipe pattern transitions that include three live video streams at the same time! The advanced ATEM 1 M/E and 2 M/E Production Studio 4K models have a powerful built in Digital Video Effects processor or DVE. You can push, spin, squeeze and swoosh your live video from one camera to the next with incredible built in DVE transitions. DVE transitions can be flip flopped and reversed giving you even more transition options. You get over 35 exciting DVE preprogramed moves to choose from. Using the DVE for transitions will increase the production value on any live production! When you want to combine sponsor logos with transitions during a live production, graphic transitions are the perfect solution! Use the DVE to create amazing flying graphic effects and logo wipe transitions. You can create high resolution logos in Photoshop CC using the included plug-in to load directly into the ATEM media pool. Photoshop CC graphics with premultiplied keys are perfect for smooth flying logos in the highest quality, as your logo moves across the screen, the shot transitions with a hidden wipe under the flying graphic! You can create exciting eye popping Stinger transitions by combining live video with animated graphics and sound effects. When you trigger a Stinger, your animation is instantly played back from a media player and keys over the live video as it wipes to the next shot. You also get simultaneously mixed sound effects with the live program output. Stingers are widely used for live sports broadcasts as great transitions to instant replays and back to the live action! Luma keys are sometimes known as a self key because the same video source is used for cutting the key and overlaying the video image. You can do this with live video from a camera, prerecorded video from a HyperDeck or graphics loaded in the media pool. Luma keys work the best with high contrast images like white elements on a black background, so that you can use the contrast to cut the black background and replace it with live video or broadcast graphics. Get incredibly clean, high quality results with Linear keying by using two separate sources for the fill and the key to create one video image! The fill signal contains video to be stacked over the background, while the key signal contains a grayscale mask to cut out or mask the area to be filled. 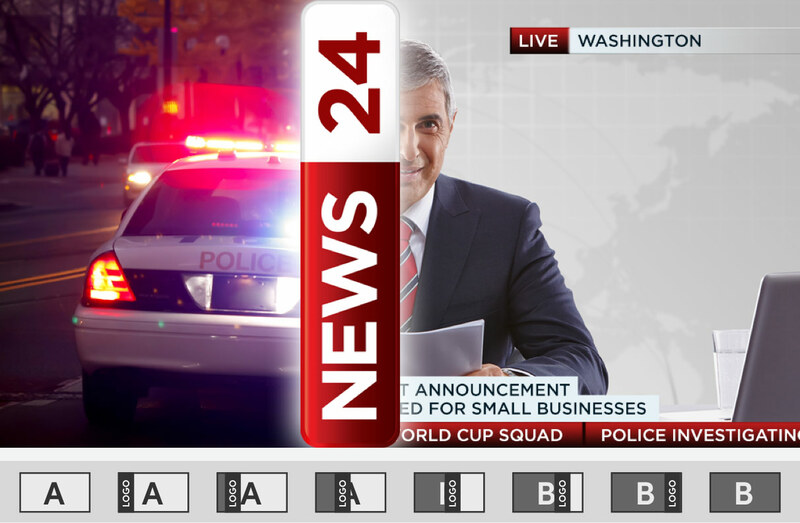 Fill and key signals can be graphics from the media pool, live motion video, or video and key from an external character generator or graphics system. Used every day for TV weather forecasts, chroma keys are a very powerful way of combining live images together in real time, cleanly in high quality! The presenter stands in front of typically a green or blue background, and the chroma keyer will remove only that color and combine it with another image such as prerecorded video or graphic. ATEM Switchers include multiple keyers so you can simultaneously combine multiple live, prerecorded, graphic and chroma key elements in real time. Create amazing transitions with the pattern key! You can use any one of the 18 built in wipe patterns to combine live images or graphics with geometric shapes. The pattern keyer gives you full pattern control including softness, symmetry, size and position completely independent of the transition block. That means you can use pattern keys to create picture in picture effects that can be transitioned to as easily as any live camera source, and you don’t need to tie up your DVE! All ATEM switchers feature two downstream keyers so you can insert high quality graphics like logos, bugs and titles over the live ‘on air’ program output. Downstream keyers are the last layers of keying so they overlay all video switched to the main program. You can also easily bypass the downstream keyers by using the clean feed aux outputs. This means you can record the clean feed as your master and use the downstream keyers for overlays that you only want on air. Move, resize, scale and rotate live video instantly! 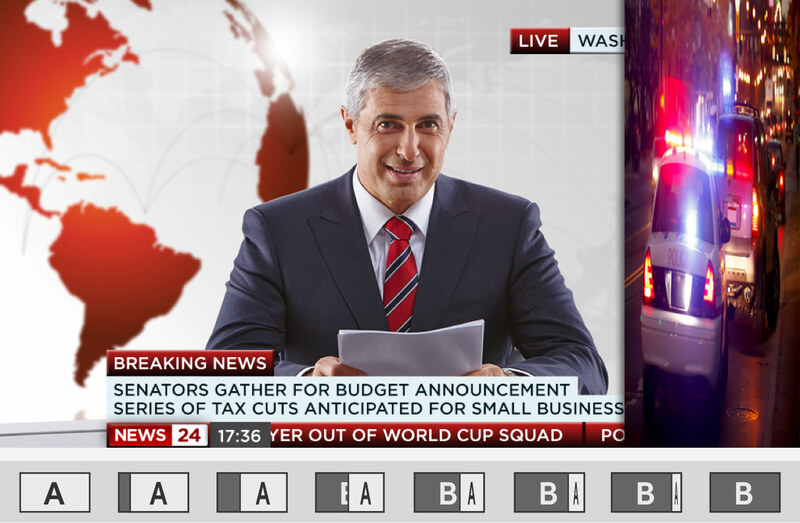 Perfect for live breaking news production, the DVE lets you create live crosses from the studio to the excitement on location. Create picture in picture effects with both the studio host and location reporter combined as one video output. The high quality DVE gives you control of size, position, rotation and features 3D borders, drop shadows and lighting! You can save customized DVE positions and automatically trigger the picture to animate full screen or zoom as the live interview concludes. Mix cameras and audio inputs with the built in audio mixer! ATEM’s built in audio mixer is incredibly powerful and easy to use! Open the audio mixer control tab on your Mac or PC and you get complete multi track mixing control with level meters! You can direct camera and external audio with precision level and balance adjustments, enable and disable channels or activate audio follow video mode instantly. 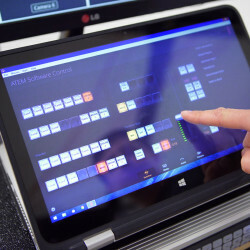 You can also connect to Mackie™ standard USB audio mixer panels, giving you hardware feedback and feel of flying faders and meter displays. The advanced ATEM 2 M/E Production Studio 4K features an amazing built in SuperSource layering switcher! In addition to 2 full M/E’s, keyers and DVE, you get an additional 4 independent DVE channels so you can resize and position live cameras, video replays, broadcast graphics and more. SuperSource is like having an additional multi layer VFX switcher built in! Imagine being able to take a satellite video feed from 4 different locations to create multi camera interviews or a picture in picture live broadcast! 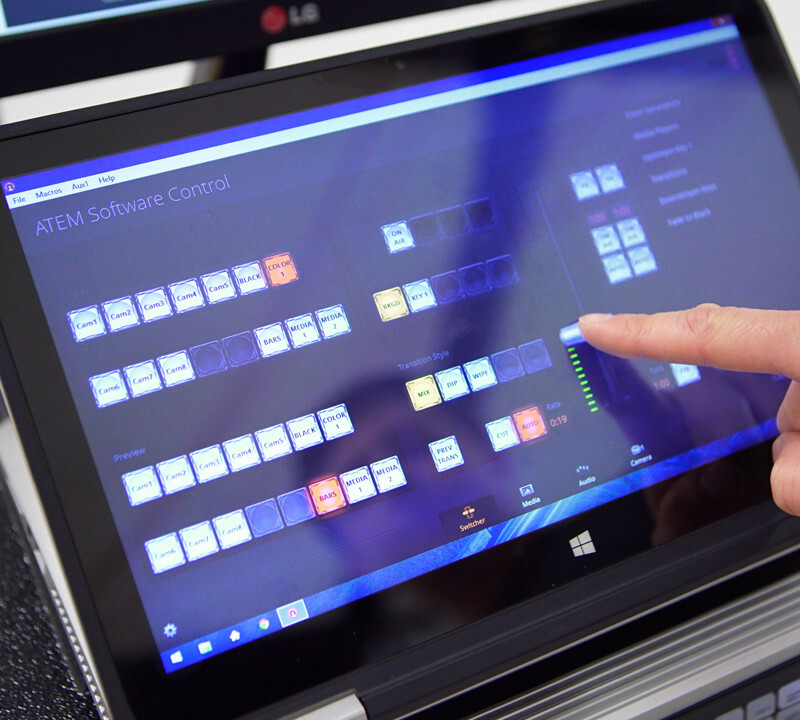 ATEM Production Studio 4K switchers let you connect loads of sources and monitor them all at the same time using the built in multi view. 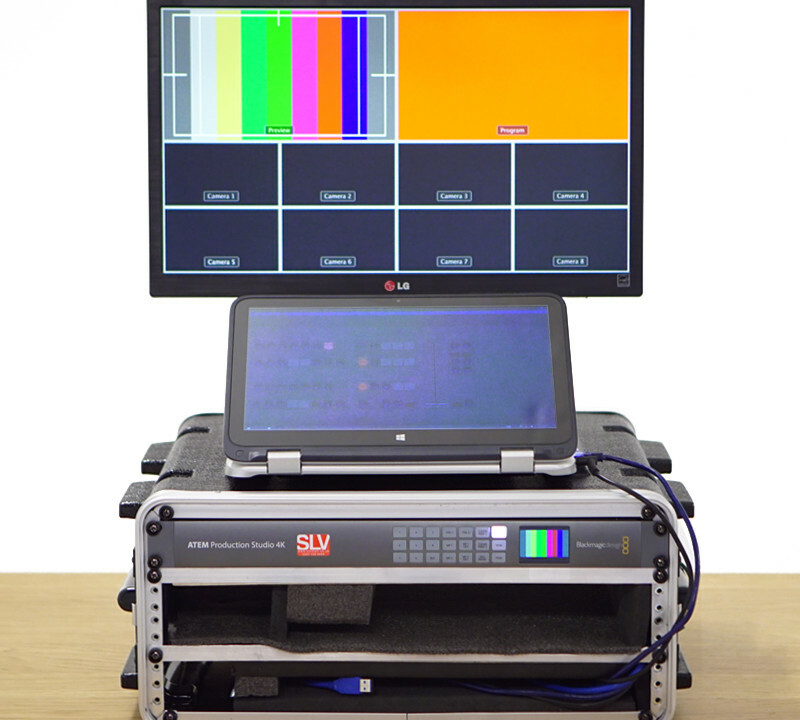 Multi view makes it easy to see your cameras, graphics, preview and program outputs on single screen. That means you don’t need lots of monitors to see all your individual cameras! 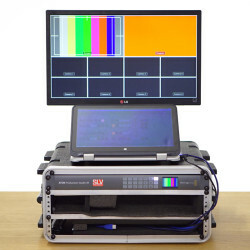 You get HDMI and SDI multi view outputs so you can connect to professional broadcast SDI monitors or even low cost big screen televisions using the HDMI multi view output! The advanced ATEM 2 M/E Production Studio 4K model features 2 independent multi view outputs so you can see up to 16 cameras across 2 screens. ATEM gives you the flexibility to work in different standards at any time! Most live production is currently being produced in HD, now you can work in SD or in the new Ultra HD standard whenever you need. ATEM Production Studio 4K switchers are designed to operate in virtually any SD, HD and Ultra HD television format, so you can operate in the SD or HD television format you need today, and then instantly switch over to Ultra HD in the future! That’s a true future proof design! ATEM 1M/E Production Studio 4K. 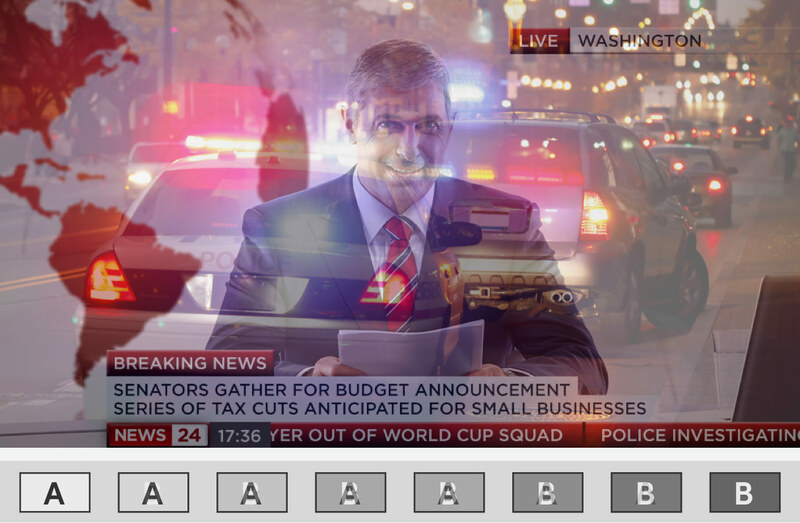 Load on-air graphics to eliminate complex external servers! With the included Photoshop CC plug-in, you can create graphics live and then instantly download them into the ATEM media pool. Most graphic designers know and use Photoshop CC every day and now you can use their creative skills on your live production! 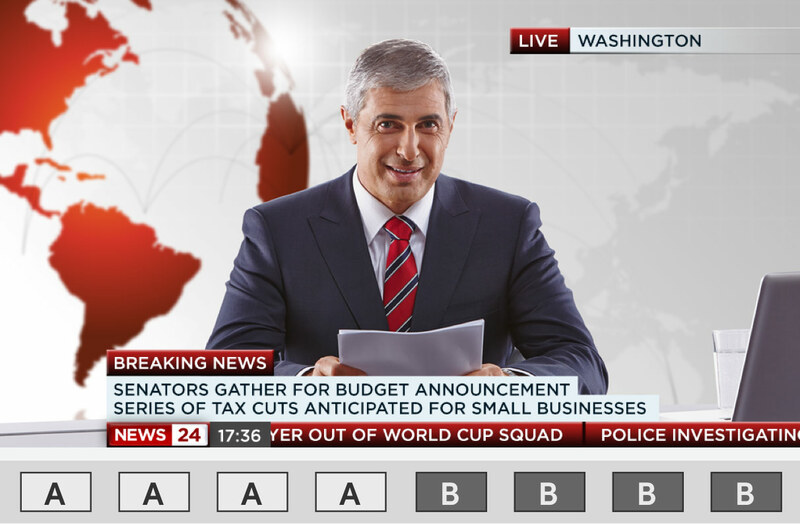 Designers can create professional broadcast graphics such as logos, lower thirds, scorecards and other real time graphics that can be downloaded directly to the media pool. 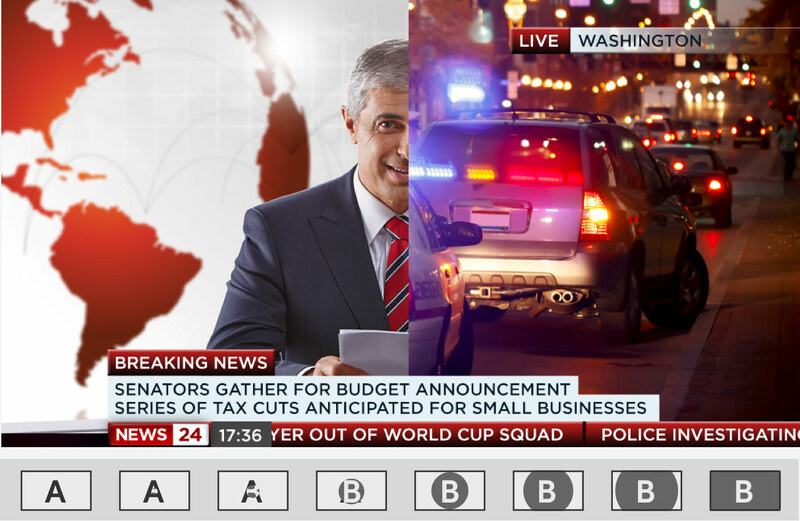 Now you can instantly change live graphics in seconds! ATEM Production Studio 4K lets you connect up to 8 SD, HD or Ultra HD 4K video cameras, disk recorders and computers to do true broadcast quality work. You get all the features you expect from a professional switcher including chroma key, transitions, media pool, downstream keyers, audio mixer, multi view and the world’s first 6G-SDI and HDMI 4K video connections. 720 x 480i 59.97Hz, 720 x 576i 50Hz,1280 x 720 59.94Hz, 1280 x 720 50Hzand 1920 x 1080 59.94Hz,1920 x 1080 50Hz,3840 x 2160 23.98Hz,3840 x 2160 24Hz, 3840 x 2160 25Hz,3840 x 2160 29.97Hz. ATEM Software Control Panel included free for Mac OS X 10.10 Yosemite, Mac OS X 10.11 El Capitan or later and Windows 8.1 64-bit or Windows 10 64-bit.